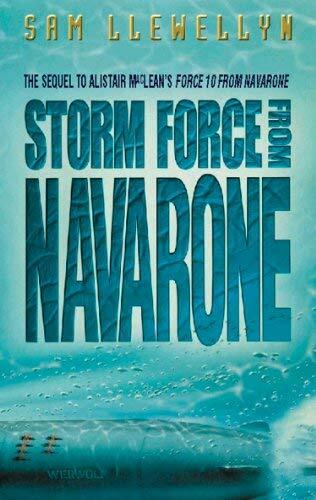 The Navarone Series deals with a trio of agents working for the S.O.E. The Special Operations Executive was a British intelligence organization created at the beginning of World War Two to engage in espionage, sabotage, and other activities as needed in enemy territories in Europe. Quite often the agents attached to this group were highly trained military officers and enlisted men but when working on an S.O.E. mission, they were there covertly and in civilian clothing making them spies under the Geneva Convention and therefore without any allusions as to their treatment and ultimate fate should they be captured. The term "Navarone" is used to describe the activities of three key people and comes about because the island of Navarone was the location of the first mission, the one that brought the trio together in the first place. They would be reunited on that Greek island briefly for the second mission but would then leave to head to the actual assignment. The two remaining recorded adventures have nothing really to do with the Navarone location except in context of the three men. The three men are Keith Mallory, Andrea Stavros, and Donovan "Dusty" Miller. Mallory is a New Zealand officer serving with the British forces for some time, holding the army rank of Captain. He was before the war an avid mountain climber making him an indespensible man in the cliffs of Navarone. The fact that he had been operating in and around Crete and was an expert in that area made him even more valuable. Andrea Stavros is a former Lt. Colonel in the now defunct Greek army, working with the Resistance and having no love whatsoever for the German invaders of his homeland. He is also a close friend and sometimes adversary of Mallory as the two had worked together before. Dusty Miller is an American explosives expert who had signed up with the R.A.F. and was brought along because he was the key man for actually destroying the artillery objective of the first mission. Once he had proven himself to the others, it was natural that he remain with the team although his dour personality coupled with his pessimism always made him a cheery complement. Mallory and Stavros like and dislike each other. Miller doesn't really like anyone, or at least trust anyone. Together they make a great team. The terrific author Alistair MacLean made his debut with the semi-autobiographical novel H.M.S. Ulysses in 1955, an adventure that still ranks as one of the greatest modern naval adventures of all time (and one of my absolutely favorite books - I still get chills when remembering it). He followed that book with his first fully fictional tale two years later. 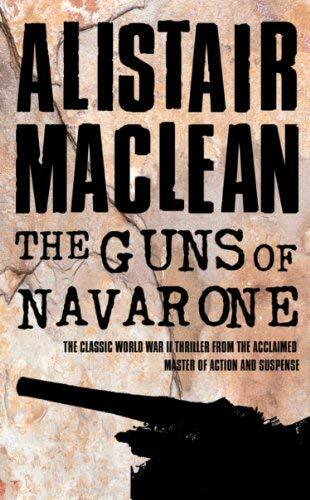 That was the first book in this series, The Guns of Navarone (TGON). MacLean was a stickler for never doing a series. For over a decade he came out with a new adventure almost yearly and each one rushed to the bestseller list because readers knew he would be penning another winner and he never let them down. And each book was about different people in different locations handling different problems. Then in 1968 he changed his no-sequel policy and created the second book though he took an interesting path in that the book followed the ending of the film that had been released in 1961, not the ending of his original novel. I have not read a definite reason for the change but I am sure the truth is out there. Whatever the reason, the characters of Mallory, Stavros, and Miller were reunited. 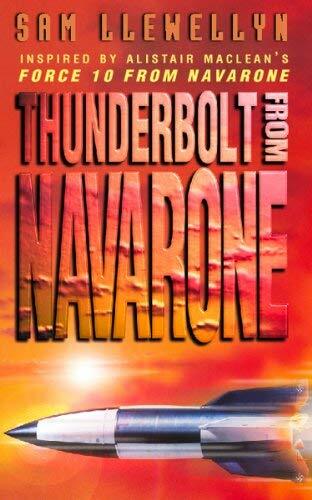 Thirty years later, author Sam Llewellyn with the blessing of the MacLean estate came up with two new adventures for the "Navarone" team. These books did not fare as well as MacLean but are worth the read. S.O.E. send British officer Captain Keith Mallory and Corporal Dusty Miller, along with Greek Lt. Col Andrea Stavros and others to infiltrate the island and destroy the guns. To rescue captive British agents in Yugoslavia, Captain Keith Mallory and Dusty Miller are again recruited by the S.O.E. To help pull off this impossible assignment, they need Andrea Stavros who is on the island of Navarone. Mallory, Stavros and Miller are sent through occupied France to a supposedly neutral Spain to disable the "Werewolf" U-boats with only six day to do their mission. Keith Mallory, Dusty Miller, and Andrea Stavros are given a new mission from Naval HQ to see about the development of a lethal German V3 rocket and destroy the facilities. The Anthology Collection of all 4 works by two authors that started in 1957 and ended in 1998 that were print together in 2008 (a period of 51 year). Based on the book by MacLean. 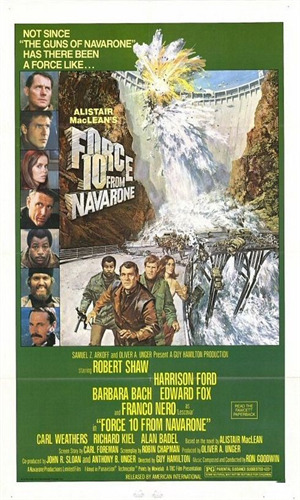 A team is sent into Greek territory to destroy massive German guns in the cliff face on the island of Navarone. Note: It won 2 Golden Globe for Best Motion Picture & Original Score. It also won an Academy Award for Best Special Effects. Plus it was nominated for 4 other Academy Awards and a Grammy. In my late teenage years when I was learning about James Bond at the same time I was hooked on Doc Savage, Tarzan, and the Shadow, I happened across a copy of H.M.S. Ulysses and to say my reading habits changed would be an understatement. Oh, I never lost my devotion to the Lord of the Jungle or the Pulp masters or the coolest spy ever; I would stay with them for years and revisit each from time to time. But my appreciation of other adventure fiction was born and I added Alistair MacLean to my list of "read everything by this author". This was for me happening in the late 60s so by that time MacLean had penned a good number of incredible tales so I had a lot of fun reading a lot of great stuff. 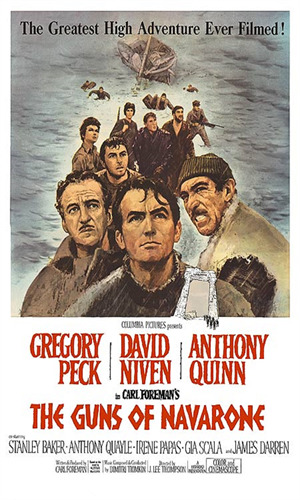 The Guns of Navarone was one of the first I found and I loved it. 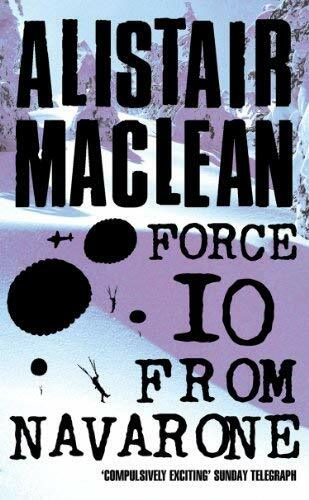 The second book, Force 10 From Navarone, was not read by me for several years and I did not care for it nearly as much but it was still MacLean and so still work a place on my bookshelves. The movie version of the first book came out in 1961 and I was far too young to have seen it. I watched it on late night television many years later and liked it well enough, despite constant commercial interruption, to want to give it a better shake which I did some years even later when the VCR version was available. Much better without the ad breaks. My lack of affection for the second book probably tainted my response to the second movie in 1978. It was "okay" but nothing to brag about. 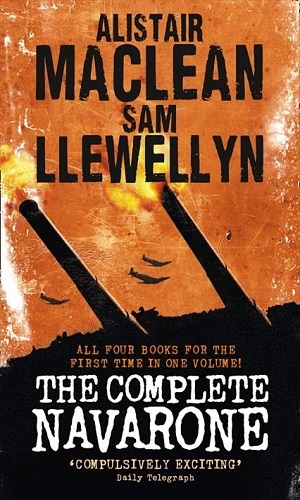 I have not read the two continuation novels by Sam Llewellyn. They are on my to-be-read stack but I have no idea when or if I will ever get to them. That may sound like I do not like them which is not true. I know little about them. I look forward to your comments to help me decide.